P1282. 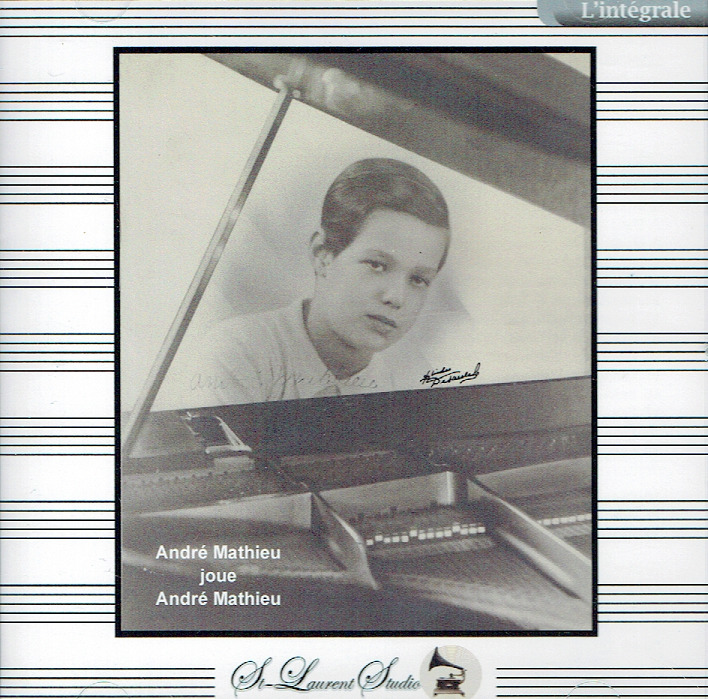 ANDRE MATHIEU: Mathieu Program (Played by the COMPOSER); w.André Kostelanetz Cond. CBS S.O. : Concerto de Québec - Andante); ANDRE MATHIEU, w.Madge-Dubé & Alexanian: Trio for Piano, Violin & Cello; ANDRE MATHIEU, w.Jean Beaudet Cond. Radio-Canada S.O. : Concerto de Québec. (Canada) 2-St Laurent Studio YSL 33-710, recorded 1943-67. Transfers by Yves St Laurent. 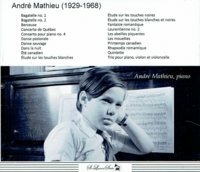 "André Mathieu was a Montreal piano prodigy, born in 1928, feted in his early life, but later forgotten, even before his early death at 39. He did most of his composing between the ages of 4 and 21, as far as is known. Probably because of his age, expression is at the core of his music rather than form and structure, but despite his age, there is a level of maturity and sophistication in the expression. [His compositions] are in the vein of works by Scriabin, Debussy, Ravel, and Rachmaninov: flowing, lyrical, impassioned, and with wide ranging, yet tonal, harmonies. Mathieu's most famous work is the Concerto de Quebec. It follows the tradition of not only Rachmaninov, but the Tchaikovsky and Grieg piano concertos. Printemps Canadien demonstrates Mathieu's ability to absorb and adapt other styles, combing lush Romanticism with jazz rhythms; Abeilles piquantes is reminiscient of Debussy and Ravel in its concise, precise, pointed depiction of bees jabbing a victim. If the works are somewhat derivative, they show a potential, supposedly unfulfilled, for greater compositions." "André Mathieu began composing at the age of 4. At age 6 Mathieu gave his first recital of his own composition at the Ritz Carlton Hotel in Montréal, on 25 February 1935. 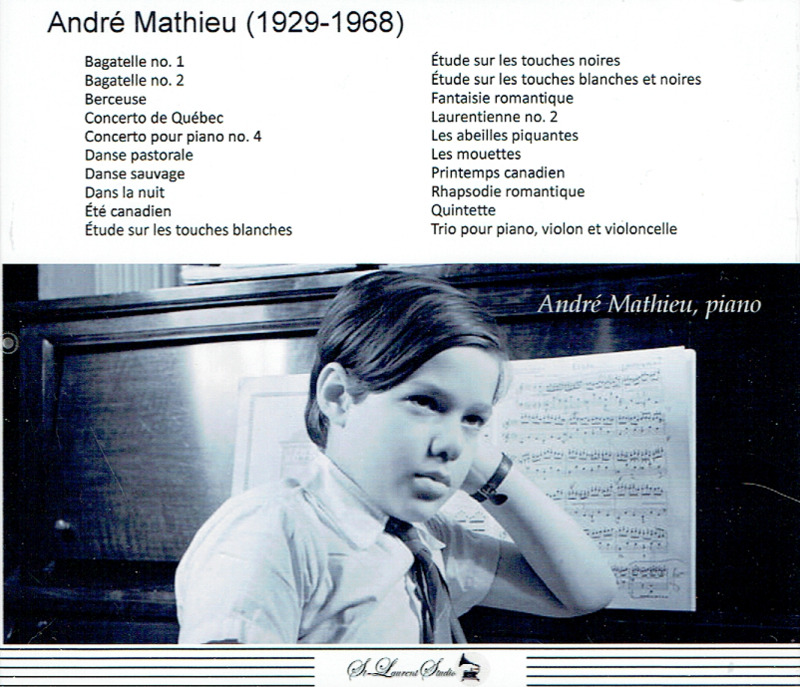 In 1936 Mathieu performed his Concertino #1 for Piano and Orchestra as a soloist on the CBC network. He was later given a grant by the Québec government that enabled him to go to Paris and study piano with Yves Nat and Mme. Giraud-Latarse. Mathieu also studied harmony and composition with Jacques de la Presle. In December 1936 Mathieu gave a recital of his works at Salle Chopin-Pleyel, and again at Salle Gaveau on 26 March 1939. His recitals were received very enthusiastically by the Parisian critics. They unanimously agreed that AndrÃ© Mathieu was a â€˜Canadian Mozartâ€™. Mathieu returned to Montréal for the holidays, but due to the outbreak of war he could not return to Europe. Instead, Mathieu performed in a series of recitals in Canada and the United States, and gave a performance at New York's Town Hall on 3 February 1940. He remained in New York with his family until 1943, studying composition with Harold Morris and fulfilling concert and radio engagements. In 1941 when he was not yet 12 years old, Mathieu won the first prize at the composition competition to commemorate the 100th anniversary of the New York Philharmonic Orchestra. He also played his Concertino #2 for piano and orchestra at Carnegie Hall. Mathieu also played his compositions at a concert of the League of Composers. In 1943 he returned to Montréal and gave numerous concerts performing Bach, Beethoven, Chopin, Liszt, Debussy and Ravel, as well as his own works. In 1946 he left Montréal for Paris to study composition with Arthur Honegger and piano with Jules Gentil. Unfortunately the trip did not go as planned. Mathieu was disappointed by his teachers, bored and short of money. He felt lonely, homesick and vulnerable. In 1947 he returned to Montréal a changed man, tired and exhausted. He took part in Pianothons to break records at events. He also began teaching and continued to compose. During the following years he succumbed to alcoholism. He married Marie-Ange Massicotte in 1960, but their marriage was short-lived due to André's alcoholism and emotional problems. André died suddenly at the age of 39 on 2 June 1968. He was a prolific composer and left behind a wide range of music. The renowned pianist and classical music activist Alain Lefèvre has popularized several of André Mathieu's works."